The first step to refinishing your hardwood flooring is deciding whether your project needs a complete refinishing job. If the floor is clearly damaged from flooding or stains, you may need to repair before refinishing. Remember that your floors need to be at least 3/4’’ thick. 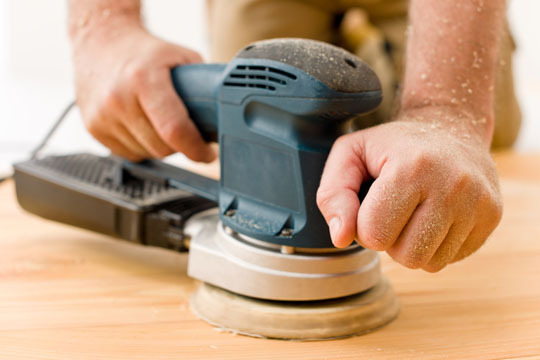 To avoid sanding down to the sub-floor, check with a professional if your floor is thinner than ¾.’’ Realize that if your floor is slightly thinner, it may not be able to be refinished. Pay close attention to the flooring beneath the hardwood. If there is a floor covering underneath, remove the old floor first. Home improvement jobs take a lot of preparation, analyzing, and time before beginning the work. The floor must be cleaned and sanded properly in order to start the refinishing process. Make sure everything is cleared out of the room. Remove all furniture and closet items and cover all light fixtures. Next, remove shoe moulding by wedging a pry bar between the moulding and the wall. Place a block of wood behind a bar to prevent damage. Seal the door with masking tape in order to close off the room from the rest of your space. Lastly, vacuum the floor to remove dirt. Begin sanding in the center of the room. Sand with the grain from one end of the room to the other, overlapping passes by an inch or two. Repeat the procedure on the other half of the room. Sand the entire center portion of the floor. After the main portion of the floor has been sanded with the drum sander, hand-sand or use an edge sander to sand areas where the drum sander did not reach. Use the same grit sandpaper you used with the drum sander. You may need to hand-sand or use a detail sander to reach the corners. When the entire floor is finished, vacuum and repeat the entire process using smaller grit (larger number) sandpaper with each pass. Finish by sanding the entire floor with 120 grit sandpaper. You can apply a clear sealer to your newly refinished floor or apply a stain, water- or oil-based. Some stains require more than one coat with a sanding between. Remember to keep the furniture out of the room until the floor is completely dry. After the floor is dry, reinstall the shoe moulding. To get the best finish, buff the floor after staining or sealing.